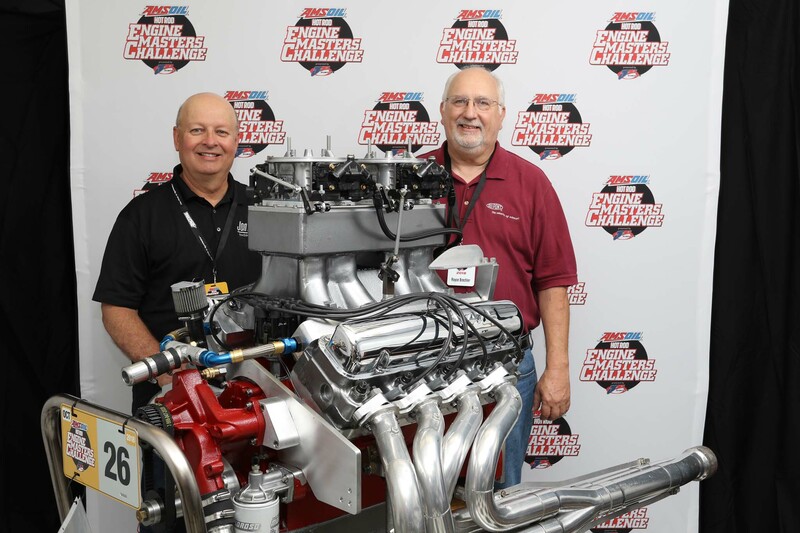 Meet the 2018 HOT ROD Engine Masters Winners! AMSOIL Engine Masters 2018 presented by JE Pistons has concluded and the winners are posted here! The 2018 Engine Masters challenge took place inside the walls of JE Pistons' Research and Development center, and the action was hot. Read on for final event standings. 2018 Engine Masters competition began with the vintage class, which pitted some of the most ingenious engine builders in the country against eachother. Using only antique iron, builders had to mix and match parts and various performance techniques to maximize horsepower and torque production. This year's field featured entries from the full spectrum of engine architectures, including Mopar's Poly, Ford's Y blocks, a Ford MEL, and even a Studebaker. Yesterday concluded competition in the Vintage Class. 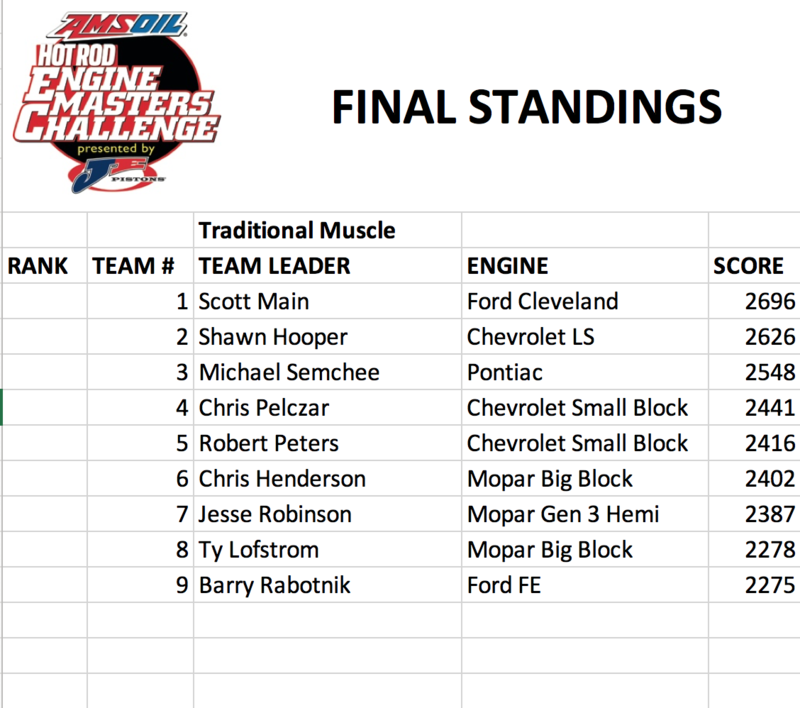 In the end, it was a close call, but Jon Kaase did his thing, winning his 8th Engine Masters challenge. The engine he brought this year is a wild mix of parts, engineering, and rulebook creativity. Using a Ford 460 (385 series) crankshaft, Kaase filled 475ci of displacement into a Ford MEL block and topped it with a highly modified tunnel ram intake and the most innovative cylinder heads you've ever seen. With the heads off, a bronze "valve seat" drops deep into the bore, through a 1in thick aluminum "head gasket" which allowed him to redesign both the intake and exhaust ports with more modern shapes. Those ports move enough air to generate 798.5 horsepower and over 800 lb-ft of torque on the dyno. It was a close race, with Joe Craine's Y-block hot on his heels, but ultimately Kaase's MEL was victorious. 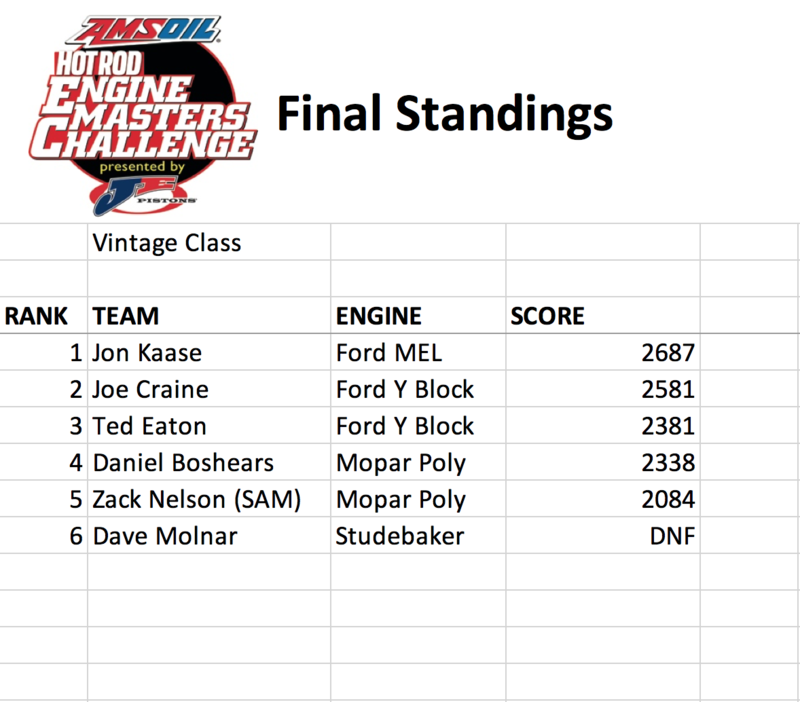 Jon Kaase and his wild, MEL Ford engine locked up a win in the vintage class in a very competitive field. Up on the dyno now is the traditional muscle class. 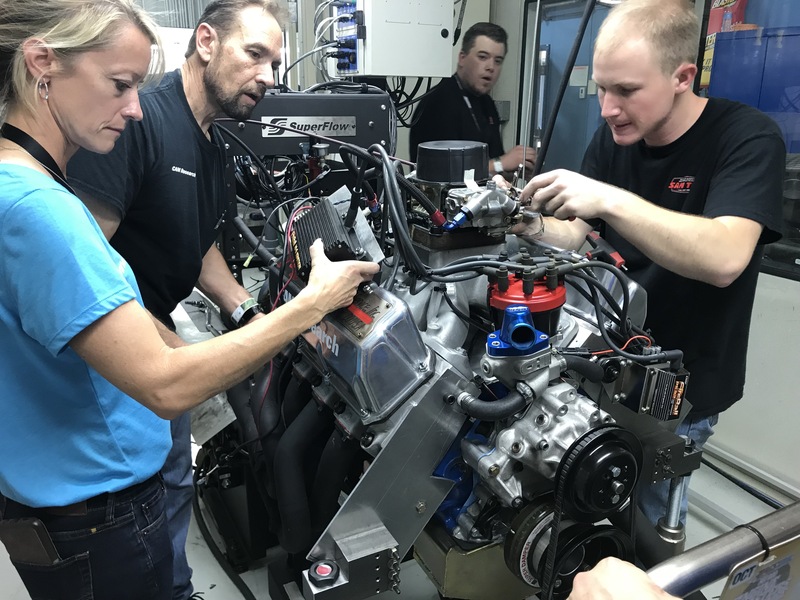 Composed of Mopar small/big-blocks, Chevrolet LS engines, third generation Mopar, Hemis, various iterations of Ford small-blocks and more, this class is as diverse as they come and generates huge numbers on the dyno. Check back later in the day for updated standings and make sure to catch all of the power-dense action on the live stream. Scott Main and the team from CAM Research took the win in the Traditional Muscle Class and their Cleveland-headed, Windsor Ford made big, 700hp power! The win in the Traditional Muscle class was hard earned and went to Scott Main and the team at CAM Research. The winning engine was based on a 400ci Windsor block with Cleveland-style cylinder heads. The massive airflow capability of those heads carried the team to victory and a 700hp power number, though it was a tough race between the School of Automotive Machinist team, lead by Shawn hooper, with only 70 points separating them. Ultimately the Ford beat out the Chevy and Scott is the 2018 Traditional Muscle champion. Here are the final standings from the Traditional Muscle Class.